Published for The President and Fellows of Harvard College. The pioneering journal in its field, Business History Review, began publication in 1926 as the Bulletin of the Business Historical Society. BHR seeks to publish articles based on rigorous primary research that address major topics of debate, offer comparative perspectives, and broaden consideration of the subject. We are interested in the history of entrepreneurs, firms, and business systems, and in the subjects of innovation, globalization, and regulation. We also explore the relation of businesses to political regimes and to the environment. 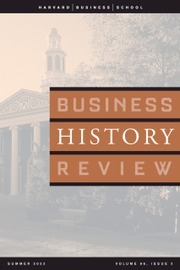 The Editorial Advisory Board of the Business History Review is pleased to announce that the winner of the 2017 Henrietta Larson Article Award is Timothy W. Guinnane, Ron Harris, and Naomi R. Lamoreaux “Contractual Freedom and Corporate Governance in Britain in the Late Nineteenth and Early Twentieth Centuries”. The article was published in the Summer 2017 issue, pp. 227-277. Click here to see the past winners of the Henrietta Larson Article Award.